Panosteitis in the GSD is very common in large breed dogs - the German shepherd, Rottweilers, Great Danes Golden Retrievers, Dobermans and Labrador Retrievers are just a few of the breeds most commonly affected. It often happens between the ages of 6 to 18 months, though middle-aged German Shepherds can sometimes have a bout of pano. AKA: Pano" can indeed be a very difficult disease to diagnose. It is characterized by lameness that comes and goes from day to day and changes from leg to leg - and is not associated with any kind of trauma or injury. Quite literally, "pano" means "inflammation of all bones" eventhough the precise cause of the disease is unknown. I have also heard it compared to the "growing pains" that often happens in human teenagers and this seems to be a very accurate analogy. Panosteitis in the GSD can be debilitating but with proper care most dogs will make a full recovery. For some reason males are more commonly affected than females with Panosteitis. Additionally, when it does occur in females it often happens in association with the first heat cycle. Panosteitis in the GSD can be painful and can last as long as 18 months. Usually though, most pano "attacks" last from 2 to 3 weeks. On a good note, this disease is self-limiting and there are very few long-term side effects or need for further treatment once it has run its course. Whenever a dog is suspected of having panosteitis individual x-rays will be taken to confirm the diagnosis in the unaffected limbs. A subtle increase in bone density is observed in the center part of the affected bones. Later on the bone will become more patchy or mottled in appearance and the outer surface of the bone may appear roughened while later on, the affected bone will still be slightly mottled, but eventually begin to return to a more normal appearance. Panosteitis symptoms include: sudden acute pain causes lameness which can shift from one leg to another. The dog may show a reluctance to walk or exercise. Also, there can also be acute pain when the affected bone(s) are squeezed firmly. 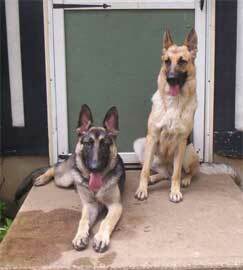 German Shepherds affected are with Pano are often very depressed and can go off their food. Occasionally some affected dogs will additionally have an elevated white blood cell count, a fever, or tonsillitis. Since pano is often quite painful, painkillers such as Canine Buffered Aspirin or Rimadyl are usually recommended even though there is no specific treatment for the disease. The treatment can be symptomatic but the outcome is usually very good. Whenever I have a German shepherd suffering from a bout of pano I confine them to as small an area as possible, cut out all unnecessary exercise (other than going out to the bathroom and eating) and try to keep them as quiet as possible for several days. Supervised crating for small periods of time may be necessary as well if your GSD cannot relax or be calm on its own. There is no known cause for Pano in the German Shepherd Dog but diet is thought to play a part as well. It has not been shown to be genetic but I think that heredity can't be ruled out at this time either. Overall the long-term prognosis for a dog with panosteitis is very good. Recurrence of clinical signs and lameness is very common and possible up until the GSD is two years of age. While clinical signs of lameness and soreness may last several weeks, complete recovery from pano is typical.